It's Supernatural Week in The Sims Social, so say "hello" to an enchanting Fairy Princess and her forest fairies that live in a land not so far away, but only if you believe in magic. However, not everyone finds the Fairy Princess and her forest friends to be enchanting. In fact, this place also houses an evil witch that has captured the forest fairies and is holding them captive. Step 1 – Do You Believe In Fairies? Hey! Who are you? What are you doing? Are you trying to break them out? Ugh, another fairy lover! Well you can't. Not even if you have a free MeadowShine Magic Well and a MeadowShine Fairy Tree from the shop! Oh wait, I wasn't supposed to tell you that... Rewards: 10 LP, 40 Coins, 15 XP, 2 Energy, and a chance to get 1 Hammer, Nails or Wrench. Step 2 – Do You Believe In Fairies? So you have a MeadowShine Magic Well after all, eh? Looks like Bella did too. Wait, wh-what are you doing? No, don't click on the well and 'Promise You Believe' in fairies! Why? Are you trying to free those pesky things? Oh, and I see you're clearing leaves from the garden. Well, not exactly what I'd do but it's a good way to spend your time, I suppose. Oh, by the way, the Magic Dust Bottle in Bella's house is pretty but 'Waving Encouragingly' on it won't get you on my good side, deary. Especially if you're doing it to free those fairies! Rewards: 10 LP, 50 Coins, 20 XP, 2 Energy, and a chance to get 1 Relaxation, Entertainment, Culture or Buzz. Step 3 – Do You Believe In Fairies? Step 4 – Do You Believe In Fairies? You know, I'm experiencing a change of heart. I've kept these poor dears in this cage for so long, they must be hungry. Why don't you cook up a nice fairy breakfast on your stove? Five servings should be enough. And look, some of the fairies have fallen asleep. Best wake them up, deary, by clicking a MeadowShine Fairy Tree then 'Wakey Wakey Fairies!' 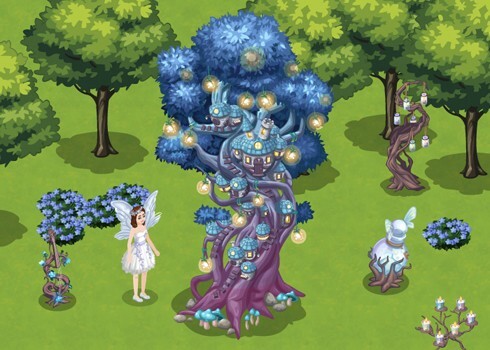 Have you completed the first stage of your MeadowShine Fairy Tree yet? You really should! It makes a great home for wayward glowy flying insect people. Rewards: 20 LP, 100 Coins, 30 XP, 3 Energy, 1 Bling. Step 5 – Do You Believe In Fairies? Oh dear me! The fairies seem to have escaped and gone into your yard! Whatever shall I do? You've broken my spell and I can't keep a straight face. They're your problem now! Didn't see that coming, did ya, deary? Enjoy the little terrors! You deserve them. Have some tips of your own for finishing these quests? Sound off in the comments. Add Comment.